I love sushi. However, not just any sushi. I love my homemade sushi. I often boil up some short grain rice (that becomes sticky when cooked; like sushi rice) and season it with some rice vinegar, a touch of honey or agave syrup and some tamari, then roll it up with some of my favorite veggies and a slice of avocado of course. I love the fact that I can be so creative with it and add whatever I have on hand. I also like that I can adjust the seasoning to how I like it. 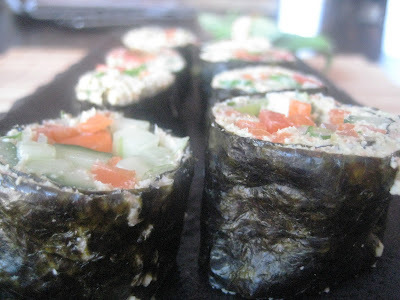 This sushi recipe is a much different take on traditional sushi but still a personal favorite. It has such great flavour and interesting textures. Enjoy! Other ideas include; grated beets, avocados, asparagus, etc. 1. Spread a couple spoonfuls of the pate on the nori sheet, leaving about ¾ inch at the edges closest and furthest from you. 2. Place a small amount of the veggies in a line close to the bottom of the sheet. 4. Cut each roll about 2cm think with a serrated knife (or a sushi knife if you have one....what a great tool). 5. Enjoy! Serve with all the fixens you normally like with sushi such as soy sauce, wasabi, pickled ginger, etc. Place ingredients in a food processor and pulse until smooth. You will need to stop a few times and scrape down sides with a spatula. This pate is great for raw sushi, served with whole grain crackers or raw veggies. What are your favorite sushi ingredients or toppings??? Howdy! This post couldn't be written any better! Reading through this post reminds me of my previous roommate! He continually kept preaching about this. I am going to send this post to him. Fairly certain he'll have a very good read. I'm slightly certain I'll be informed lots of new stuff proper right here! I seriously love your site.. Pleasant colors & theme. Did you create this website yourself? Please reply back as I'm trying to create my very own site and would love to learn where you got this from or exactly what the theme is named. Appreciate it! Hello Τhere. I found your ωеblοg thе uѕe οf msn. That is a veгy neatly wrіtten aгticlе. anԁ come baсκ to learn extra of youг useful information. Thanks for thе рost. I'll definitely comeback. 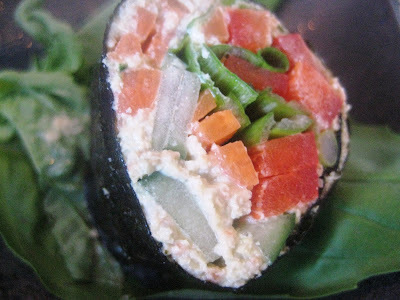 Thanks for finally writing about > "Raw sushi" < Loved it! I've read this post and if I could I want to suggest you few interesting things or suggestions. Maybe you can write next articles referring to this article. I wish to read more things about it!